The Lexmark C782n XL combines impressive performance and media handling with innovative high-yield cartridge pricing to lower the cost of high-volume colour printing. Printing responsibly means everyone wins – your business, your budget and the environment! All of Lexmark’s XL colour lasers are designed with sustainability in mind. They’re incredibly quiet and equipped with a range of eco-conscious features to help you print greener at every level. Colour. It’s what your business craves. But if you print a lot in colour, the cost of supplies can be hard to swallow. Lexmark has a solution that lets high-volume workgroups print in colour without worrying about the cost of consumables. The Lexmark C782n XL colour laser printer combines the power of colour with unique cartridge pricing to help you save money and time by printing professional colour documents in-house. While colour toner cartridges typically cost more than their black equivalents, all Original Lexmark XL High Yield Toner Cartridges – black, cyan, yellow and magenta – are offered at the same low price. In addition, these cartridges deliver an impressive 16,500* pages, so you can print longer and use fewer cartridges overall. While your actual cost per page will vary based on the amount of coverage (the percentage of the page covered by black and colour toner), your colour cost-per-page can drop to just pennies. The savings add up fast when you print in-house with a Lexmark XL Series printer. Your staff can print labels, promotional signs, marketing materials and banners on the same device they use for their everyday printing. You’ll save time by maintaining centralized control; save money by printing short-run jobs more economically in-house; and save the planet by printing on demand, eliminating wasteful overruns and obsolete documents. The Lexmark C782n XL delivers crisp text and graphics and accurate, well-balanced images from first page to last. Like all Lexmark colour lasers, it features Lexmark’s new chemically processed toners for exceptional colour and detail. A wide variety of accessories and paper handling options let you tailor your Lexmark C782n XL to meet your unique requirements. You can even equip it with a scanner, upgrading it to a multifunction device. 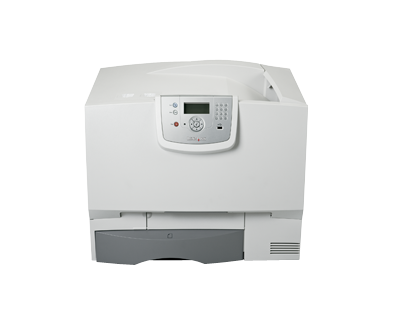 The Lexmark C782n XL is robust, reliable and incredibly fast. You get the performance and innovations you need to produce brilliant colour output in-house, reducing the need for outsourcing.